(Matt Agorist) For the first time in history, families of victims of the 9/11 terror attacks are using a new law and are going after Saudi Arabia in a lawsuit for their role in the attacks. In this landmark lawsuit, the families of 800 victims are suing Saudi Arabia for aiding the hijackers. For more than a decade and a half, Presidents Barack Obama and George W. Bush kept secret the alleged role Saudi Arabia played in the September 11 attacks on America. Becuase of the cozy relationship the US has with the terrorist nation, special interests within the government have chosen to protect their Saudi friends instead of telling Americans the truth about what happened that fateful day. Only because of the vigilance of those seeking the truth is this lawsuit now a reality. 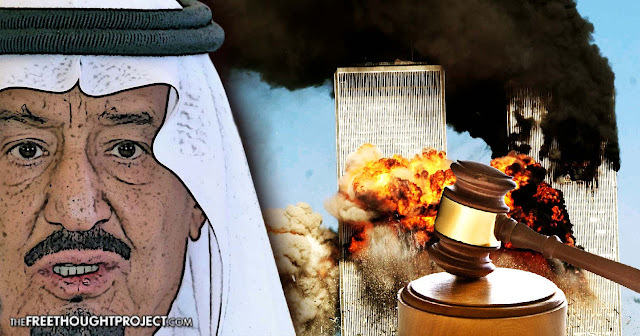 This lawsuit is possible because last year, the U.S. House of Representatives, following the lead of the Senate, passed a bill, the “Justice Against Sponsors of Terrorism Act” (JASTA), allowing Americans to sue Saudi Arabia over 9/11. When the bill made it to the President’s desk, however, Obama quickly showed his loyalty to Saudi Arabia and vetoed it. However, that was only the beginning of the rollercoaster. Aside from US curtseying to the Saudi regime, another reason for the veto was obvious as this bill opens up a venue and allow lawsuits against the U.S. for alleged sponsorship of terrorist activities in their own countries – a Pandora’s Box that then-President Obama, and the CIA most certainly did not want to open with the world watching. However, it appears for now, that Pandora’s Box is open. As most Americans know, 15 of the 19 hijackers on 9/11 were from Saudi Arabia and three of them were actual government employs of the kingdom. In spite of this fact, the United States invaded Iraq — not Saudi Arabia. To illustrate just how well connected the Saudi regime is in the US, they are also absent from President Donald Trump’s travel ban — in spite of being responsible for the overwhelming majority of terrorist activity carried out in the US. Although the US government knew about the role of Saudi Arabia on 9/11, they kept this information secret until last year when the once classified 28-pages were released. Sen. Bob Graham, a co-chairman of the investigation committee was a strong advocate of declassifying the information and his campaign was successful on July 15, 2016. While JASTA will allow these families of victims of 9/11 to overcome the current restrictions barring them from suing foreign governments, a new section of the bill, added at the last minute, essentially allows the heads of the Justice and State departments to stay any lawsuits indefinitely. The inserted provisions allow for organizational heads to simply “inform the judge hearing the case that the US government has engaged with Riyadh in diplomatic talks to resolve the issue.” Additionally, the attorney general can petition the court for an extension of the stay for “additional 180-day periods,” effectively delaying lawsuits against the Saudis indefinitely. Whether or not the Trump regime will use this provision to protect the terrorist state of Saudi Arabia is unknown for the time being. However, his posture toward the kingdom, thus far, indicates that blocking the lawsuits is not off the table. “This lawsuit is a demonstration of the unwavering commitment of the 9/11 families to hold Saudi Arabia accountable for its critical role in the 9/11 attacks,” Kreindler said. The Free Thought Project would like to express our support for these families and if and when this lawsuit is blocked, we will do our best to expose those behind it. Please share this article with your friends and family to let them know that in spite of the federal government’s best intentions at protecting this terrorist regime, the power of the people is winning.